co-star of The Secret and best-selling author of Nightingale-Conant's The Missing Secret ! Over the last thirty years, I figured out how to focus the awesome power of the Law of Attraction on the specific goal of bringing wealth and financial opportunity into my life. Since then, I've enjoyed success and a life filled with luxury that few people can imagine. And so have countless others who've used my proven moneymaking methods. Now I want to share these money-attracting secrets with you. If you've got money (or lack of it) on your mind right now, then I've got good news. You read that right ... good news. GREAT news, in fact. There has never been a better moment for you to become wealthy. Oh, I know, I know. You've got every TV talking head, every know-it-all economist, and every headline-hungry journalist out there shouting the exact opposite thing in your face 24/7. Don't worry. I'm not asking you not to believe them ... not yet, anyway. I will tell you that the money-making secrets I'm about to share with you have nothing to do with the economy, the stock market, real estate, your investments, or any of the things people usually associate with the word money. No. What I'm talking about is an income source that is infinitely more stable, secure, reliable, and controllable than any of those. I'm talking about the foundation of income. The place where it all comes from. And how YOU can gain access to that place. Many years ago, I was introduced to something called the Law of Attraction. That was the first step on a journey that led me to this income source. I tapped into it, and my life was completely and utterly transformed. Fast-forward to the present day: The Secret hit the Internet, became a worldwide sensation, and catapulted the Law of Attraction into the awareness of millions and millions of people - introducing them to the mind-blowing truth that your thoughts ... your mindset ... attract and create your reality. I was fortunate enough to be one of the co-stars of The Secret. Then, not long after, I authored the Nightingale-Conant bestseller The Missing Secret. Well, you couldn't bring that question to a better guy. Before I discovered the Law of Attraction, I was about as UN-rich as a person can get. Jobless. Homeless. Directionless. I wanted a better life. But I didn't have the slightest idea how to get it. Today I'm a millionaire many, many times over, with a life of luxury and an ability to "give back" that few people can imagine. What made that transformation possible was indeed The Law of Attraction. .... a set of other "secrets" that I uncovered, refined, expanded, and - over a period of many years - shaped into an organized system for money and wealth creation. This completely original combination of spiritual wisdom and practical knowledge is what ultimately enabled me to harness the power of the Law of Attraction ... concentrate it ... and focus it like a laser beam on the single-minded task of attracting large amounts of money into my life. These secrets have made me immune to the ebbs and flows of the economy. These secrets have made it possible for me to have everything I want, from beautiful cars to magnificent homes to dream vacations and so much more. These secrets have freed me from every anxiety about money, wealth, security, and financial freedom. Best of all, these secrets have enabled me to give more, do more, help more, and make more good things happen in the world than I ever thought a single person could. But in order for that to happen, you must first accept something fundamental and incontrovertible about the way the universe works. Something few people know, and even fewer act on. You are either a) attracting wealth, or b) attracting poverty. There IS no option c.
That's a pretty startling proposition when you first encounter it. It took me a while to believe it, and even longer to figure out what to do about it. What about you? I'll bet that at this very moment, you're scanning your brain for thoughts and beliefs that might be keeping you from having more money, and coming up short. You're thinking that YOU don't have any negative beliefs about money ... YOU think money is a good thing, that having more of it will only bring good things into your life. Right? See, that's the problem. The negative beliefs are insidious. Planted so deep down, buried so far beneath your awareness, operating at such a fundamental level that they are all but invisible to your conscious mind. And there, in that dark, silent place, they wreak havoc - attracting exactly what you THINK you DON'T want. You can dream about, wish, and even work for more money all day long. But until you identify and eliminate those deep-seated beliefs, you'll never attract it. I had to look way back into my past and deep into my soul to figure out how to root out and eradicate my own negative money beliefs. It was hard. It was stressful. And it took a long time. Luckily, that's not going to happen to you. In a minute, I'll tell you how you can get rid of the blocks that are stopping you from attracting money, painlessly and in a remarkably short amount of time. That's Step One. And once you've taken it, you will have gone a long way toward clearing the path for wealth to flow your way. It's called the Law of Right Action - a little-understood and even less talked-about universal principle. Yet as I discovered during my own journey to prosperity, it is a critical component of wealth-attraction. Why? Because money doesn't "work" if it's static. In order for it to flow, grow, enhance your life, enhance other people's lives, bring you the things you want - do all that good stuff that makes a pile of paper and metal so valuable in the first place - money has to circulate. It has to move to you, through you, from you, and back again, in certain specific ways. That's where the Law of Right Action comes in. The Law of Attraction brings money to you. The Law of Right Action gets it circulating. Put the two together, and more money will start flowing your way in a steady stream and growing in a satisfying way. Could they get even better? So I started thinking. And tinkering. I took what I'd learned about these two laws and committed myself to learning more. I added the practical skills and expertise I'd developed in order to successfully launch my career as an author and entrepreneur - expertise in marketing, business-building, publicity, and more. And I paid attention to the results I was getting as I started to make my way in the world armed with this new body of combined knowledge. Step by step, through trial and error, I worked out the kinks and filled in the gaps until I'd come up with the system I told you about before. A system for money attraction that was watertight, streamlined, replicable, and as far as I've experienced, virtually foolproof. I rode this system to massive riches myself. Here and there, bit by bit, I shared it with others. They, too, experienced incredible results. And that was really exciting for me. But I have to confess, I've never revealed my complete system, all at once and in its entirety, to anyone. To be honest, I wasn't sure that people were ready for wealth-creation information of this depth and detail. I may have been right, too ... before now. And it's time for these secrets to come out. ... I have decided to unveil my COMPLETE PERSONAL SYSTEM FOR ATTRACTING MONEY. Uncensored. Unedited. Every single thing I have done, what I'm doing right now, and will continue to do , in order to sustain, increase, and share my wealth. It's called The Secret to Attracting Money: A Practical Spiritual System for Abundance and Prosperity. It contains information you will not hear or find anywhere else. And I am here to tell you that if you listen to it, believe it, and take inspired action, you will experience a financial transformation the likes of which will blow you away. So, what ARE my Secrets to Attracting Money? I've organized my system into six secret-and-strategy-packed audio sessions that will lead you logically and organically through the process of attracting money - from the foundational mindset stuff, all the way through to real-world, cash-generating action. We didn't waste a single second of recording time on this program. Everything you hear is going to ramp up your money-attracting power to an unprecedented level. We hit the ground running in Session One: "The Spirit of Wealth Building: Your Money Attractor Assessment." I've already mentioned that identifying, eliminating, and replacing your money-blocking beliefs is the essential first step in the process of wealth attraction. Where your beliefs about money come from. They're not as obvious as you may think, which is why it's essential that you examine them all. The only thing you have to do if you want to change your beliefs. With this, the process becomes virtually automatic. Why you have to stop needing money if you really want to attract it ... and how to let go of "need" without getting rid of "want." The timing has never been better for Session Two: "How to Make Money in Any Economic Climate." After all, some of the greatest fortunes in history - and plenty of under-the-radar ones too - have been made during economic downturns, recessions, and depressions. And it's happening right now too. Why the economic climate - good, bad, or indifferent - doesn't matter. You won't hear this on TV or read about it in the paper – too bad, because it is an indisputable truth that could change millions of lives and the disposition of the whole planet. 7 principles that will get you in the right mindset to attract money now – including one that was profoundly life-changing for me (and might be for you too). How to "complain" your way to riches. But not the way you might think! Say it aloud, but then do THESE 4 THINGS right afterwards. You'll turn complaints into intentions and intentions into dollars-and-cents results. Magic! The counterintuitive way to kick your money-attracting power into high gear. You'll think I'm crazy when you hear it. But trust me, it works. I tried it - and ended the day $15,000 richer than when I started it. No reason you can't experience something just as amazing or even better. The thoughts you need to let go of today. This will surprise you. WARNING: Your most precious money-attracting resource is in grave danger. And who is putting it there? YOU! But these 7 steps will help you erect a wall of armor around it. You will feel an immediate difference in the quality of your life and the effectiveness of your actions. Confused about your life's purpose? Ask yourself this ONE QUESTION, and you'll get instant clarity and direction. Why you need to give money AWAY now if you want to attract it later. Do you feel yourself instinctively resisting that idea? I'll tell you what that means, and how to use it to your advantage. REVEALED HERE FOR THE FIRST TIME EVER: A belief-cleaning process so intense, I almost didn't put it in this program. I'm still a little hesitant - it's extremely powerful. But if you make it this far, I think you might be ready for it. A new way to think about your job. This simple, subtle mindset distinction will end up making a huge difference in your attitude, performance, and results at work. The single greatest reason for attracting money. A lot of people, maybe you, think it's a little bit "wrong" to openly want money. You won't anymore, though, once you realize that it gives you the power to do THIS. Three ways you can stop poverty. You? Yes, you! Stop it your own life. Stop it in other people's lives. It all comes down to a few simple actions. The most effective money-making idea I can give you. It's the secret to most of the world's great fortunes. Once you know it, you'll find ways to use it every day. It will change the landscape of your life. And, of course, make you VERY rich in the process. How to shift your mind so it always expects opportunities. Your everyday world is packed with cash-generating opportunities that are impossible for you to see with your current mindset. Think of this secret as night-vision goggles for your consciousness. What's happening in wealthy people's minds that ISN'T happening in yours ... YET. Session Four: "Money Myths Revealed" is a real mind blower. The fact is, most of us are walking around in a cultural trance. Conditioned from birth and encouraged all our lives to believe all kinds of things about money that are out-and-out LIES! Do you want to do good things in the world? Help people? Make a difference? This myth makes that virtually impossible - and an astonishing number of people believe it unquestioningly. The widely promoted myth about abundance that is a self-fulfilling prophecy of doom. If you think it's true, then it becomes true. And what a shame that is. Thankfully, it's an easy one to let go of once you recognize it. The dangerous myth about financial crises. Financial institutions are real, and so are the bad things that sometimes happen to them. But the perceived notions of how people should respond to these events are as wrong as wrong can be. If you're stressing over the current economy, you need to hear this NOW! The destructive myth you can overturn when you let go of fear. Hard, but oh-so-powerful. I'll walk you through it. Rewire your brain for wealth and success. My "money biography" exercise will help you do it. The biggest, greatest, most profound shortcut I can give you. Do this (it's something soooo easy) and you'll actually create a new vibrational signal that will cut through all the blocks and attract exactly what you want in that very moment. Amazing. Need money right NOW? Here's what you must do - and what you must stop doing - immediately, to change your energy dynamic and get cash flowing back in your direction fast. EFT body-tapping techniques that will "clear" you instantly. This incredible process bypasses conscious thought entirely and goes right to the source, clearing them in a matter of seconds. How to painlessly remove negative people from your life. Naysayers. Glass-half-emptyers. Do-nothings. Grumps. If they're in your life, they're in your way - jamming your attracting signals with their negativity. I'll show you how to clear them out without harm, foul, or hurt feelings. The four-statement mantra that will change everything for you. Words can't describe it. You just have to experience it. You might recall that I've subtitled my program, "A Practical Spiritual System." In the sixth and final session, "Money Mastery Seminar: 10 Wealth-Building Innovations," WE GET PRACTICAL. YES, I want to use the Law of Attraction to bring money into my life easily and automatically, starting right now. This, my friend, is where ATTRACTION MEETS ACTION in an explosive combination that's going to pump money into your life from sources, in amounts, and with a speed that will stun you. I've spent 30 years creating, launching, marketing, and profiting from more businesses, products, and enterprises than I can count - and helping my friends and students do the same. In this session I download for you the very best of everything I've learned and done. Tools. Strategies. Websites. Actual turnkey business ideas. Everything. My own personal "golden shelf." Knowledge has gotten me where I am today. And the more than a dozen book and audio titles I share with you in this session are, to me, the Holy Grail of knowledge. The ideas they contain are remarkable, priceless, and life-changing. Read. Listen. Profit. One of the most important time-management secrets you'll ever hear. My income multiplied 10 times over when I finally figured this one out. You can apply it in all kinds of ways, and the results will shock you. How to put your to-do list on autopilot. Most days I wake up with fewer things to do than I had when I went to sleep. And I don't sleepwalk! The simple technique I share works like a charm, virtually doubling your results with no extra work. The thing you should always work on first in the morning. Approaching my work this way made a massive difference in my output, and the quality of my work skyrocketed too. Now, I wouldn't dream of doing it differently. How to create an information empire in your own life. You know, have, or do something that can make you rich. Everyone does. All you have to do is figure out what it is and how to get it out to the world. I'll help you do just that: start to finish, step by step. Seldom used, little-known tricks for getting word of your business out to huge numbers of people. You don't need a huge advertising budget or major marketing know-how to create a huge splash, massive buzz, and the major cash flow that comes along with it. Here's how to market like a miser but profit like a king. Zero-effort businesses you can start today. How can it be "zero" effort? Well, I sold tens of thousands of copies of a book I didn't write, using an ad I didn't create, and raked in all the profits myself. It was absolutely ethical. It was incredibly easy. YOU can do the exact same thing - and all kinds of things just like it. I'll tell you exactly what and exactly how. Websites that will make launching your online business a cinch to set up and run. Don't let the Internet wilderness scare you off. I'll direct you to the handful of sites you need to get things going. No tech-expertise necessary. If you can hunt and peck on your computer keyboard, you can do this. The Million-Dollar Secret Formula. Big name, big promise, and BIG payoff. A completely customizable 5-step formula for attracting money on YOUR terms. Wondering what YOU could ever possibly do for a business? I guarantee you've got a cash-generating business idea inside you right now. And I'll go you one better than that: By the end of this session, you'll know the EXACT business you want to start - and how to get it off the ground fast. "But I really don't have any passions or interests!" No problem. You can just cash in on someone else's. An underutilized cash opportunity that's ridiculously easy. And tons, TONS, more. All of which will help you to attract money on an accelerated, turbocharged level. As I've said before, this program isn't just about attraction. It's about action. And it's not just about listening. It's about doing. The workbook that accompanies the audio sessions is an absolutely critical component of the program for that very reason. Packed with exercises, assessments, and information you won't hear on the CDs , the guidebook will engage all of your senses in the active process of money-attraction - and help reinforce what you learn at both the conscious and subconscious levels. Don't even think about leaving it in the package. This system will not work without it. And there's more. Order The Secret to Attracting Money now and you'll also get THREE FREE BONUSES that will tie it all together. I love music CDs that come with liner notes. Personal reflections that give you some insight into what was going on with an artist or band while they were creating the music you're listening to. ... and a lot more. These are the things that have helped me to make that system work better and better. And also, some of the missteps I made along the way, laid out here so that you can avoid repeating them. It's pretty personal stuff. But this program wouldn't be complete without it. If you've ever attended a really great seminar or speech, you know that nothing quite equals the energy and enthusiasm a live event generates. And we've done a fantastic job here. You'll really feel as if you're there. And seeing these profound ideas presented will make them come alive for you on yet another level of awareness, further strengthening your powers of attraction. I've shared a little of my personal story with you in this letter. In this one-on-one interview, I tell all. It's a story more than worth hearing. And because it illustrates so profoundly the transformational power of these principles. From homeless to millionaire. If that was possible for me, then just imagine what's possible for you! All in all, The Secret to Attracting Money is THE most comprehensive collection of wealth-attracting ideas, information, and strategies I have ever presented, ANYWHERE, in ANY format. It's a true landmark. And now that it's ready, I cannot wait for you to hear it. I've been perfecting these secrets for 30 years. True prosperity is an incredible gift. It's a gift YOU deserve. And no matter what anyone says, it's a gift that IS available to you - RIGHT NOW. Order The Secret to Attracting Money right now. Listen to it. Learn from it. Internalize the principles, study the strategies, and put them into practice. If you follow the steps I lay out precisely, you won't have to wait long before cash and opportunities start showing up for you. Your life is going to start changing immediately, in very obvious and tangible ways. But I don't want you to experience mere change. I want you to experience what I did with this system: a radical, ground-up, complete financial transformation. At the start of this letter, I said that the time has never been better for you to become wealthy. Because NOW is when this extraordinary information has found its way to you. Most people never even know they have the innate ability to attract wealth. YOU not only know about it ... you know what to do with it. Don't let that awareness go to waste. Think differently. Act differently. Begin right now. 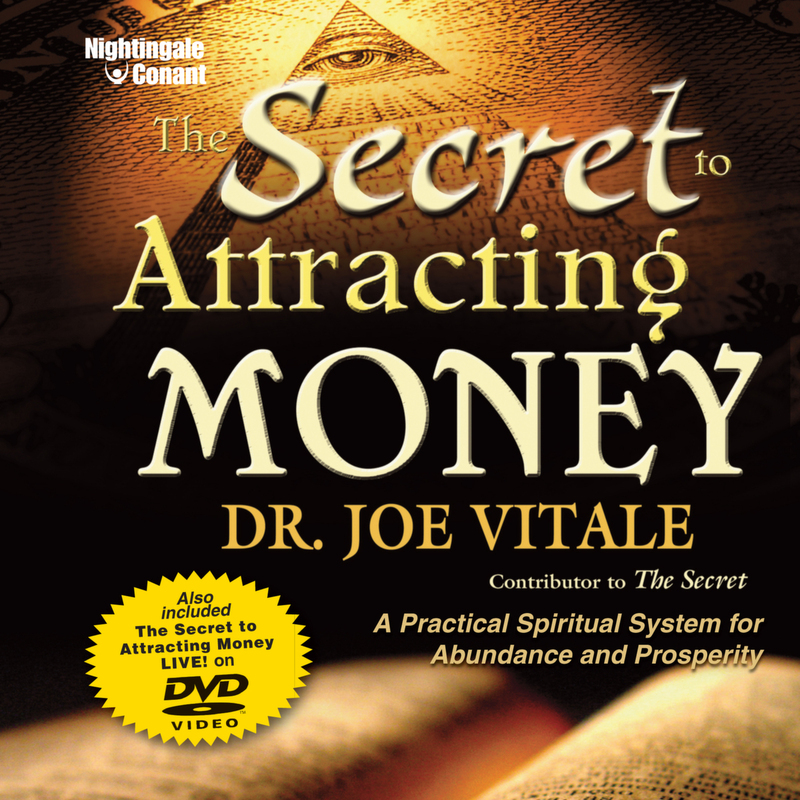 Order The Secret to Attracting Money today. Dr. Joe Vitale is the bestselling author of books such as The Attractor Factor (Second Edition), The Key, Zero Limits, Life's Missing Instruction Manual, Hypnotic Writing, and Buying Trances. Joe also was a lead contributor to The Secret and is the author of the bestselling Nightingale-Conant programs The Power of Outrageous Marketing and The Missing Secret. I want to use the Law of Attraction to bring money into my life easily and automatically, starting right now. The Secret to Attracting Money, at the special price below. - I can select one of two ways of ordering.